The origin of this tea is leaf from China tea bush cultivars. Try a second steeping of 4-6 minutes – you may be pleasantly surprised! This fine leaf, lightly twisted, and very tippy golden brown Fujian black tea is classified as a gong-fu tea: that is, tea that is skillfully made and exhibits excellent crafting. We recently sourced this excellent 2018 harvest and purchased it enthusiastically. This ‘Extra Tippy’ style is a nice counterpoint to our long-leaf Bai Lin. Both are excellent examples of their different cultivars, terroirs, and manufactures. This tea was good when it was newly-harvested and it has become more glorious with the time passed this year. We would expect it to drink well until at least 2023 and perhaps longer. This extra-tippy, small-leaf Bai Lin shows early-plucked leaves and therefore has abundant sweetness without the astringency that would often be found in a later spring pluck. The dry leaf has a pervasive aroma. A combination of dry woody ( think freshly-cut fruitwood, not forest floor mushroom woody), biscuit, tomato stem, ever-so-slightly-damp moss, and dew-y tree bark. The overall effect is quite aromatic and encourages steeping to discover what the flavor profile will be in the liquid tea. 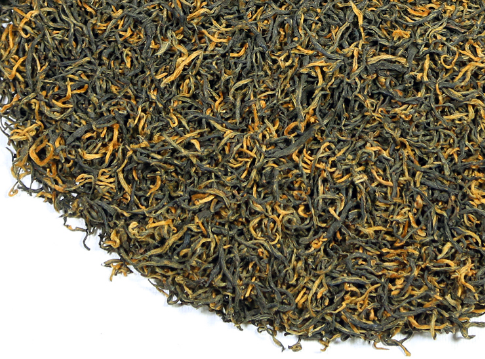 The wet leaf shows even hydration and becomes a classic ‘mahogany’ tea color. The wet leaf has a clean aroma that continues to show the woody character that is so prominent in the dry leaf. The tea’s liquor has good mouthfeel but at the same time is light and clean, never heavy or thick. It has a great color that can best be described as clear golden burgundy. This very hard-to-procure tea is an eastern China black tea for tea enthusiasts who enjoy the style of a fruity Ceylon black tea, Yunnan old tea bush varietal, or a slightly malty, long leaf orthodox Assam. Bai Lin has the soft-flavor profile and underlying sweetness that is characteristic of only a few premium Chinese black teas. This generally soft, full-bodied tea also has slight ‘pull’, but without any astringency. There is a flavor component that is reminiscent of a super creamy chocolate (Dairy Milk or Milka Alpenmilch?). One can also pick out the flavor of cherry pips and petit beurre, two classic tea profile flavor points. The aroma offers clarity, but with the biscuit-y, cocoa-y complexity that makes it hard to pin-point as to what tastes will follow in the cup. This is a tea that has a wonderful disconnect from the aroma to the taste – a good lesson in the inability to predict flavor based on aroma. The tea producing town of Hu Lin makes old-style black teas that are processed in a similar fashion to our Golden Monkey teas from the neighboring town of Panyang. This was one of the first regions to manufacture black tea back in the 17th century, and several of the other teas from this small region have gone out of production due to Fujian’s need for production of oolong and white tea. 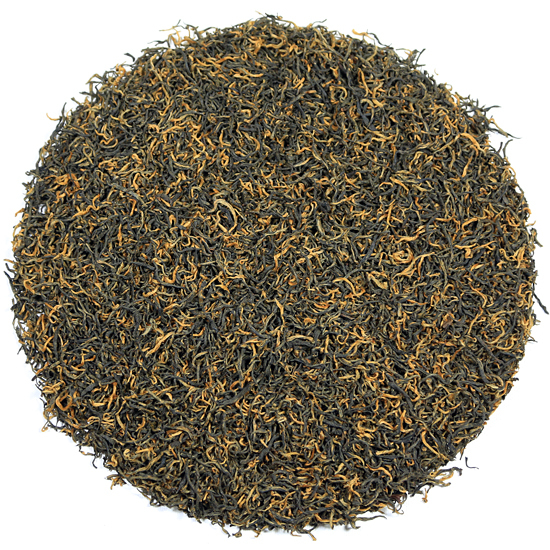 Tea Trekker is very happy to have this distinctive Bai Lin offering. Sip it black and you should find that no milk or sugar is needed.